I like it sometimes when I’m all cozy and dry in my tent and sleeping bag and it rains. The patter of the drops on the tent fly make a personalized drum beat for me to sleep to. Taking you back to that night of day 2, our group was high above the “wash” (dried up river bed), camping at the Elephant Canyon 2 (EC2) site. My companions wisely choose tent locations less exposed than I. This meant I got a lot more wind during the night. First thing I remember about waking up was the rumble. We had hiked and slept through some thunder already but this was a more consistent noise. Low and powerful like a never-ending freight train rolling by. Popped my boots on and shimmied out of my tent to find the skies cloudy and withholding their rain. The strong winds below clouds in and around us making the surrounding peaks and rocks appear and disappear regularly. Note in the picture above you cannot see the needles (they would be above and to the right of my tent). Below is a photo I snapped just a couple minutes later when they were revealed. The wash. Yup, the noise had to be the run-off from last night’s rains. I went and looked at what was a dry wash last night to find a fair bit of water flowing through it now. This was concerning as, if you remember from my previous post, we were camping part way into a canyon where the trail followed *IN* the wash. If the wash was now a creek/stream/river, today’s journey would be an adventure. And so it was. I took advantage of the lack of rain to break down my tent and pack it up. My companions arose and we had breakfast. Over breakfast we discussed our planned journey for that day. See, as the rangers said, it was going to continue raining all day and night making the already inclement weather worse. Couple this with the fact that we knew from the rangers that if it did rain, which it had, we could not walk our planned route due to flooding. Consulting our map it looked like we could not move east and with more rain promised for this day, we were concerned about being trapped due to the flooded washes. With this in mind, we decided to make our way back to civilization and take the trail we should have used yesterday to make our premature exit from the out back. This plan was eagerly agreed to by all and seemed to brighten our spirits as we knew that that night, we’d have showers and a warm dry bed. 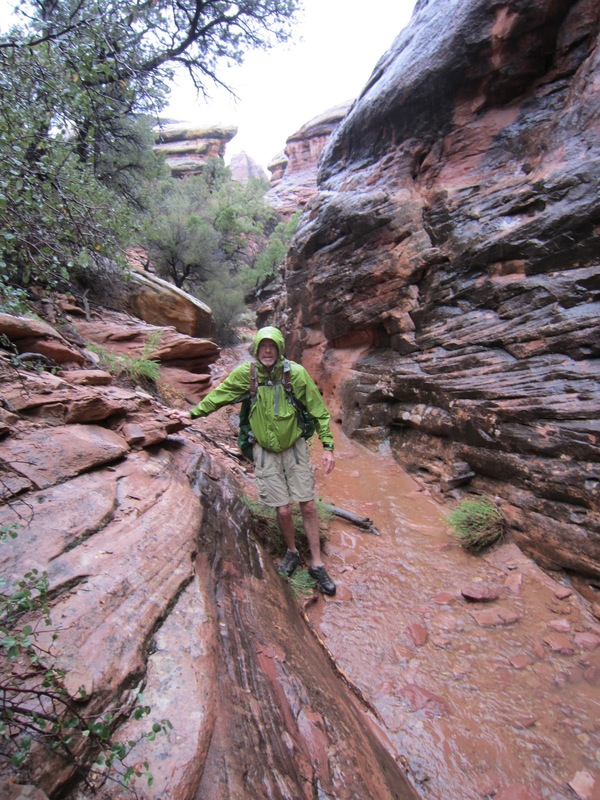 The challenge was in hiking the 0.8 miles through the water out of Elephant Canyon. This would be an interesting morning for sure. Well, we didn’t actually swim but we did a LOT of jumping and hopping through and over the water. The trick was in following the cairns. These are what marked the trail. For those that do not know, a cairn is a man-made piled of rocks (https://en.wikipedia.org/wiki/Cairn). Since there were ample rocks out here, these little monuments (ranging from 8 inches to over 2 feet tall in places) marked where the trail passed and showed us where it turned. 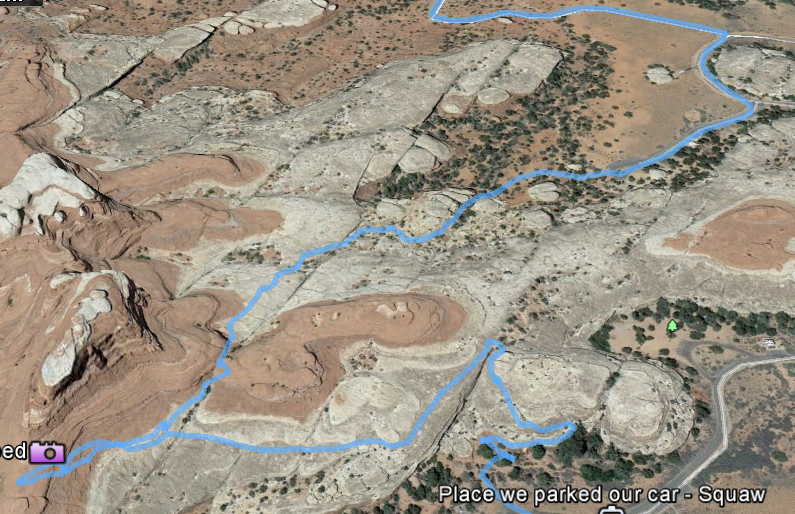 The issue was that the trail was in the wash and we could not walk there. So we spotted a cairn, walked above the stream/river a ways and tried to spot the next cairn. This was difficult as the rains had picked back up. Some places we could not cross the water to get to where the cairns told us the trail led. Don’t get me wrong here, this was no raging river with torrents of water 30 feet wide and 20 deep. Nothing like that. But it was up to about 10-12 feet wide in places and over 1-2 feet deep. And the water was definitely moving swiftly. We made it out of Elephant Canyon. 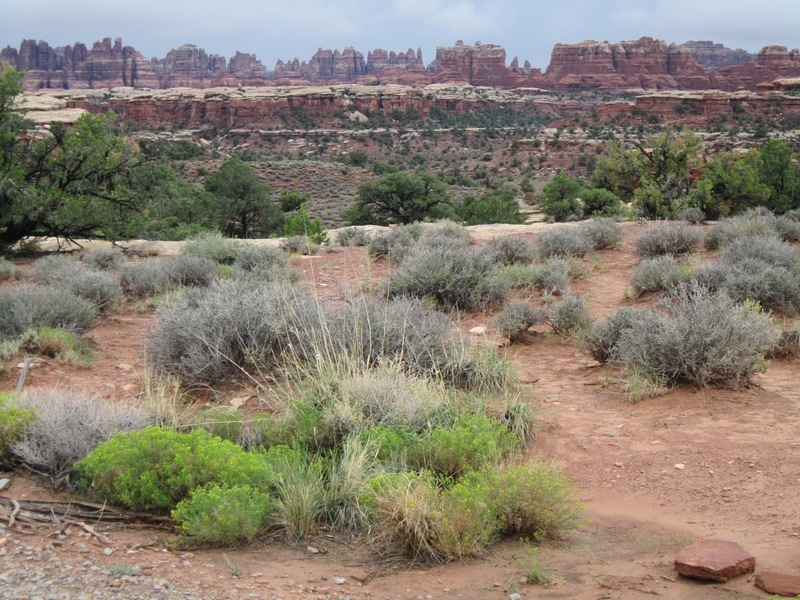 Just as we transitioned from our trail to the Chesler Park (CP) one, I mentioned that we should check for a sheltered place we could take a break and grab some food. The CP trail took us from the canyon floor up into the rocks that made the canyon. 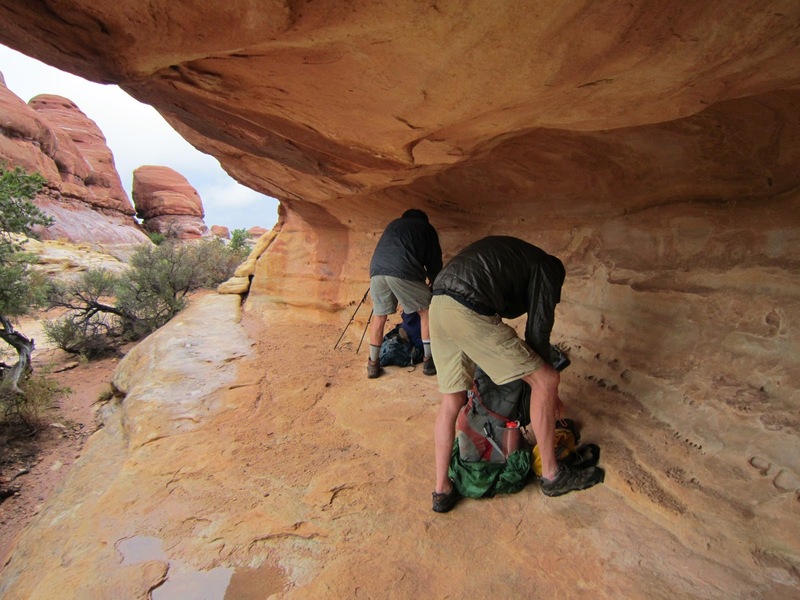 We hadn’t hiked more than 100 feet after I asked for a dry spot when we saw a rock out-cropping that was the perfect place for three soggy backpackers to rest. 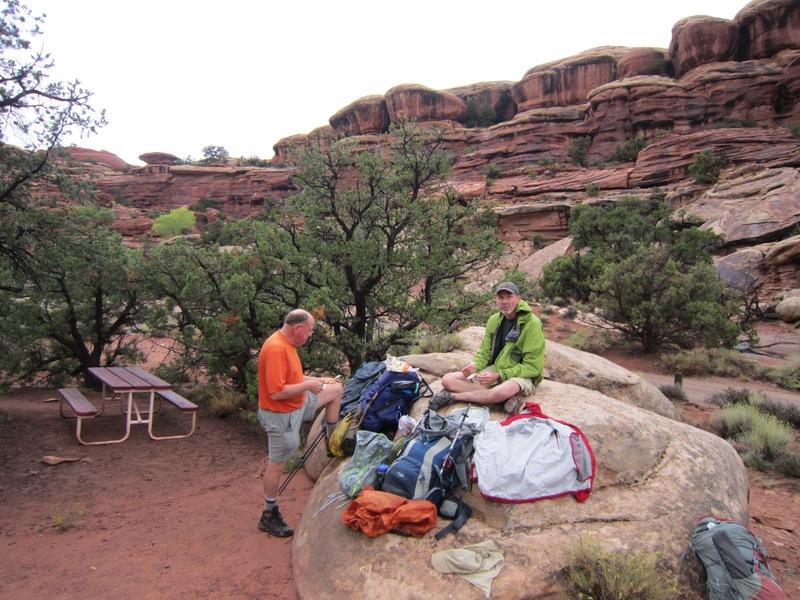 It was dry (pic on left), had place for our packs and for us to sit and was dry (did I mention that?). We took our packs off and grabbed some food and drink. It was now late morning (after 11am) and our relief at being out of the rain washed over us and again, brightened our spirits. The rains picked up briefly but we did not care. We ate and listened/watched the rain come down. 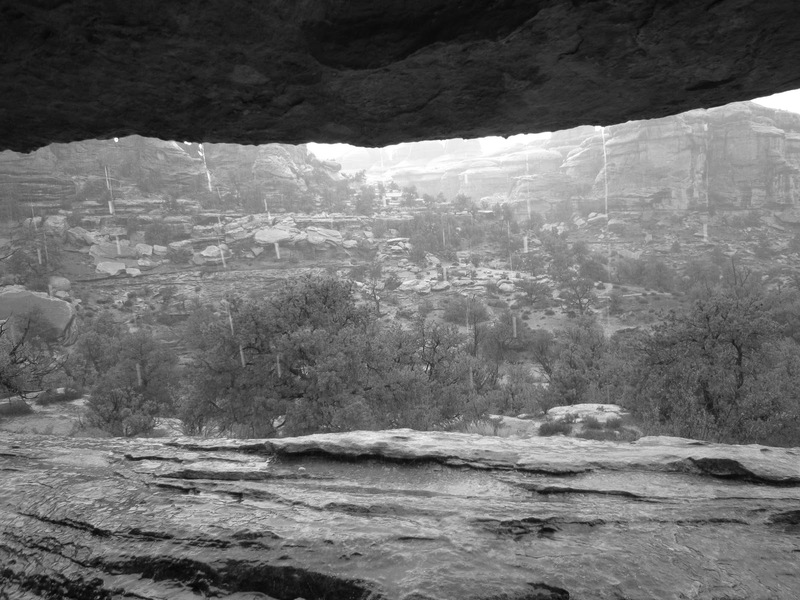 The picture on the right is from our dry spot inside the over-hang looking out into the canyon we had just emerged from. 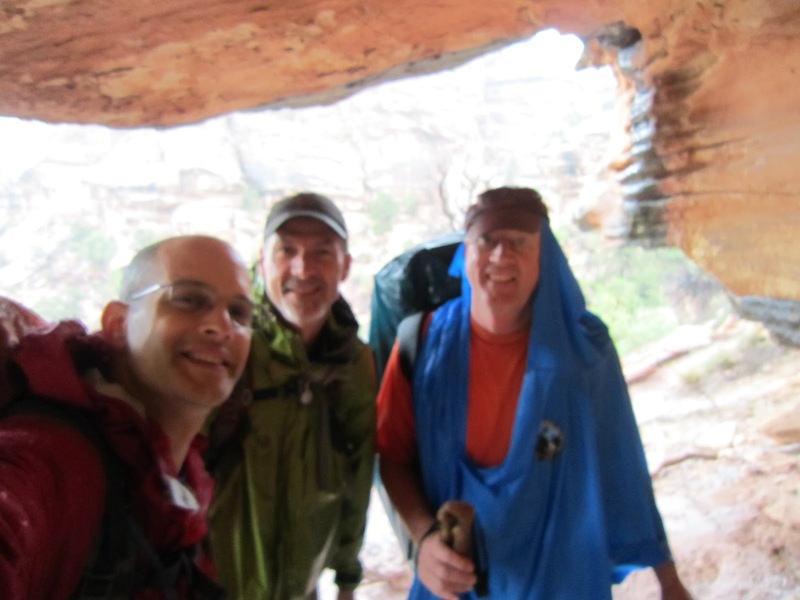 With food and water in us, knowledge that we were on the right trail and just having completed a brief break from the constant rain, we found our smiles, packed up and headed back into the rain. 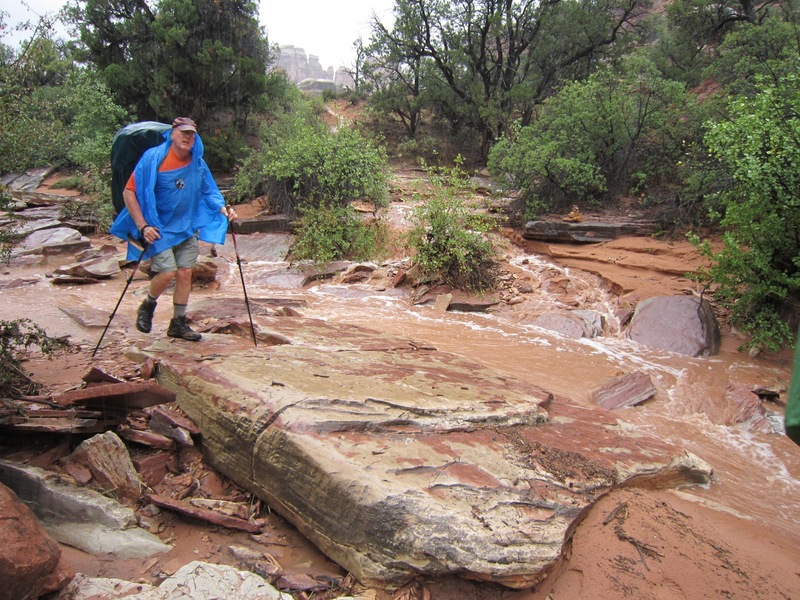 Instead of walking in the floor of the canyon and having to deal with the rushing water, we were moving up and down cracks and trails in the rock and had to deal with rushing water. The cliffs on either side of us spat drops of rain onto us as we passed by. 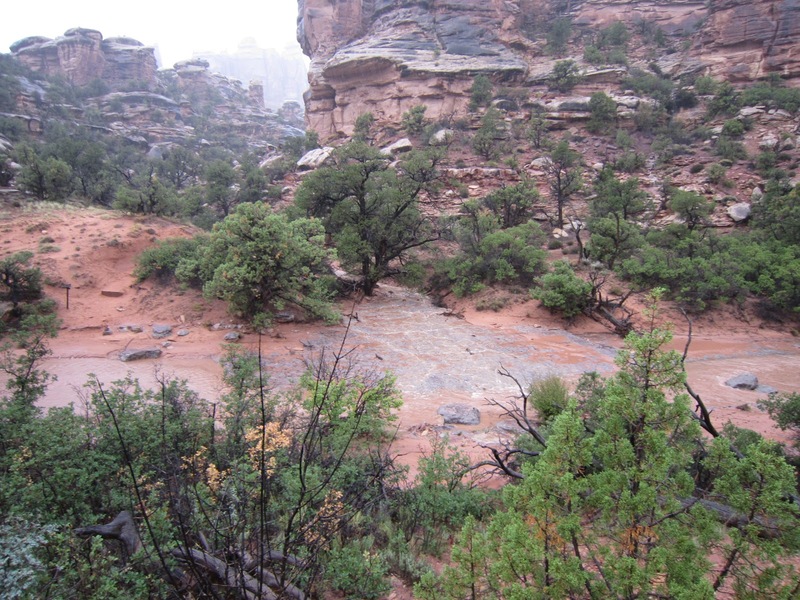 We marveled in how this are dealt with this powerful torrent of sand-filled water and better understood how these canyons were formed. We saw waterfalls and other beautiful rain-scapes along this part of our walk: things that few visitors of this area saw. 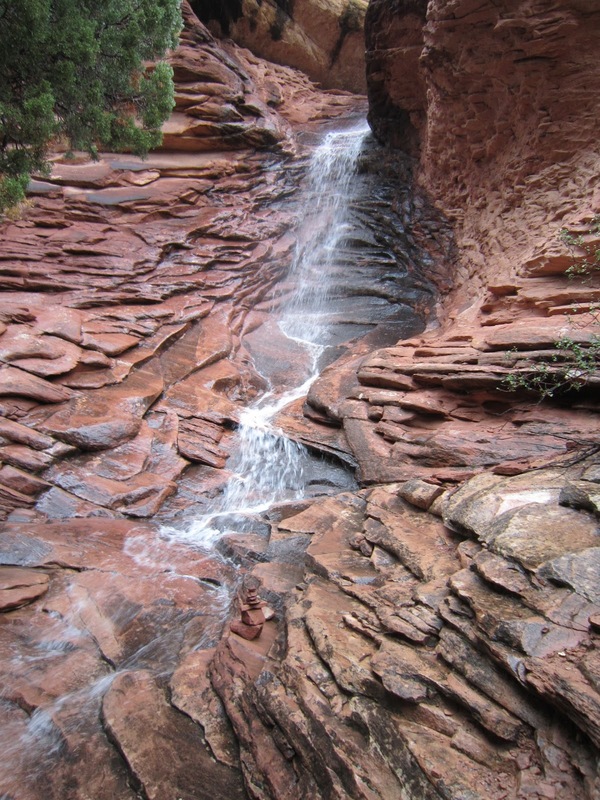 Sometimes we walked through the streams of water cascading down the rock and sometimes we could navigate around them. We walked through cracks and narrow passages between the rocks; our boots stomping through water. 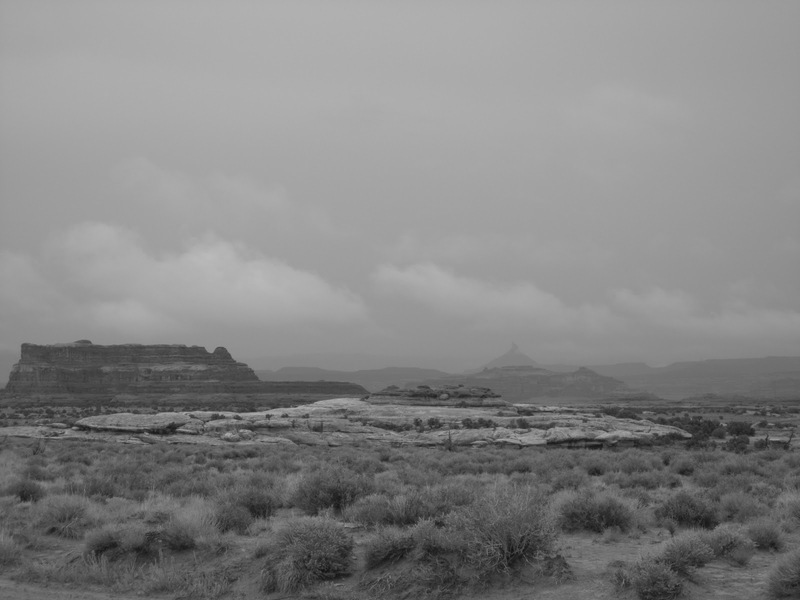 And we surfaced on top of a plateau to storm clouds and finally a view of our surroundings. The rains calmed…then…stopped as we emerged from our trails and made it to Elephant Hill parking lot just in time for lunch. Part one of our trip to our car had ended. We were no longer in the back country. In fact, as we descended the trail towards our lunch rock, we briefly spoke with another park ranger. She was the first person we’d seen since the previous day’s visit by Ranger Muse on the trail. Had it only been one day ago? We knew we had to walk three miles on this gravel road (route map on right) to get back to our car. We could do that. It was a road. It was gravel. It was only three miles. 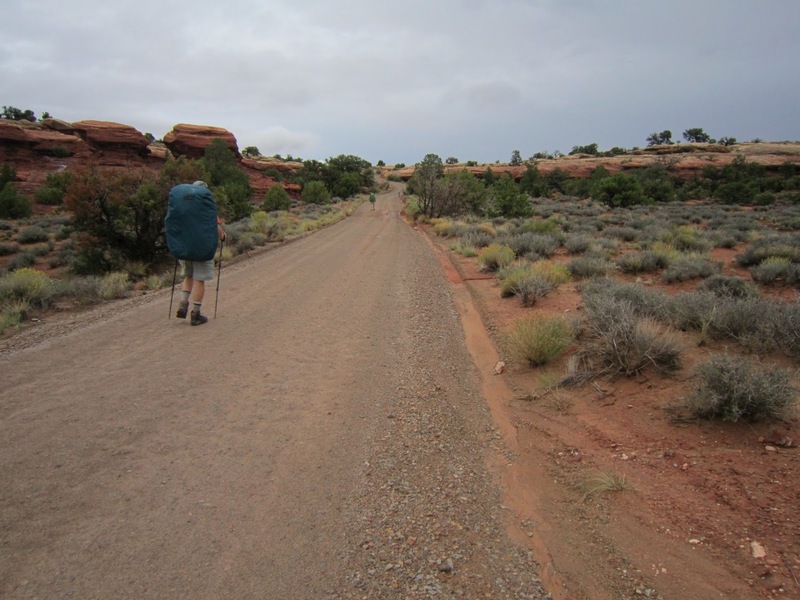 With lunch completed, we walked the open road towards our dry car. Walking this road was so much different from how the day started out; jumping over rushing water in the back country. It was almost surreal how we’d walked out of a dangerous situation and, well, onto a long gravel road. Felt good to just walk though. Not have to worry about slipping down some crevice or putting your boot into a huge puddle. Until we reached two sections of the road that were totally covered in water. 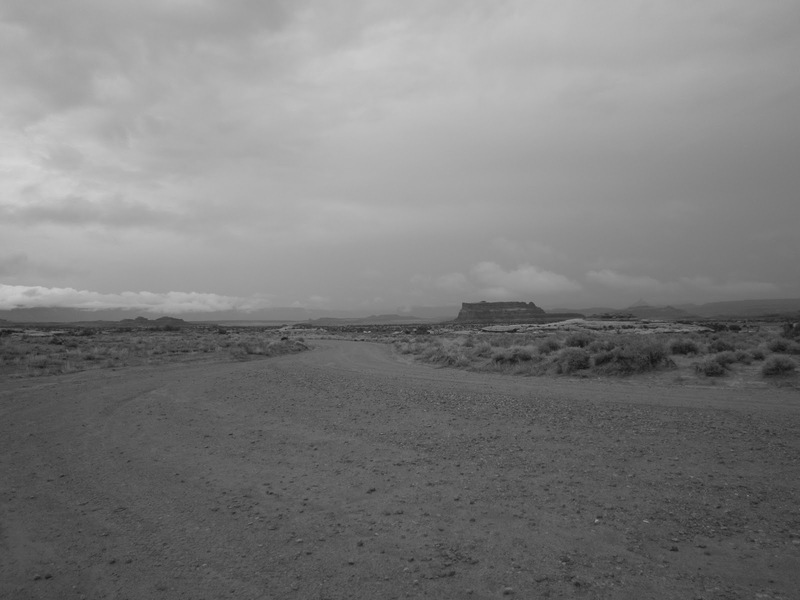 See, this was a 4 x 4 road and they didn’t reroute the washes for it. So, in two places we again had to jump and hop and balance and cross swiftly-moving, wide streams of water. Broke up the boredom for a bit. Did I mention how boring it is to walk on roads? It was great, however, to be able to lengthen our strides and walk at a strong, fast pace. The clouds hung low on the land and the rains mostly had ceased as we made our way towards Squaw Flat campground A and our car. Now you may have noticed on the map above that I did not connect the magenta path we hiked to our car. There was a reason for that. When Is the Shortest Route Not the Shortest Route? The answer is: when you REALLY want to get somewhere. And we did. By now our feet were soaked, we were running low on water (funny isn’t it…water, water everywhere and…you know) and we had mentally already checked out…at least I had. I was walking on a gravel road. No problem. 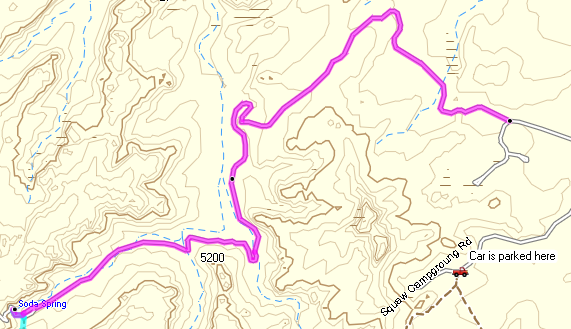 Well, we got to the end of the road and had to make a decision: continue on the road and walk a farther distance OR take a short trail from Squaw Flat B to Squaw Flat A. It was a no-brainer. Shorter path won. But it was not easy. Unfortunately I have no pics from this section of the hike since I was so focused and just getting to the damn car. On the right is an actual map of from my trail GPS’s track displayed in Google Earth. Doesn’t look like much from here but, once again, the rain started and once again we walked through puddles and flowing water. And my spirit sank a little. We were maybe 3/10 of a mile from our car and yet, it was taking us a lot of time to get there. But get there we did. We threw our packs in the car, got in, cranked the heat and drove to the ranger station to return some animal-proof food bags we’d borrowed from them. Stop on by the visitor center on your way out of the park and give us a report on the trail conditions and water situation. And so we did. We told her and two other rangers about our over-night and today’s adventure. We thanked Ranger Muse for telling us what lied ahead on the Big Springs trail the day before. 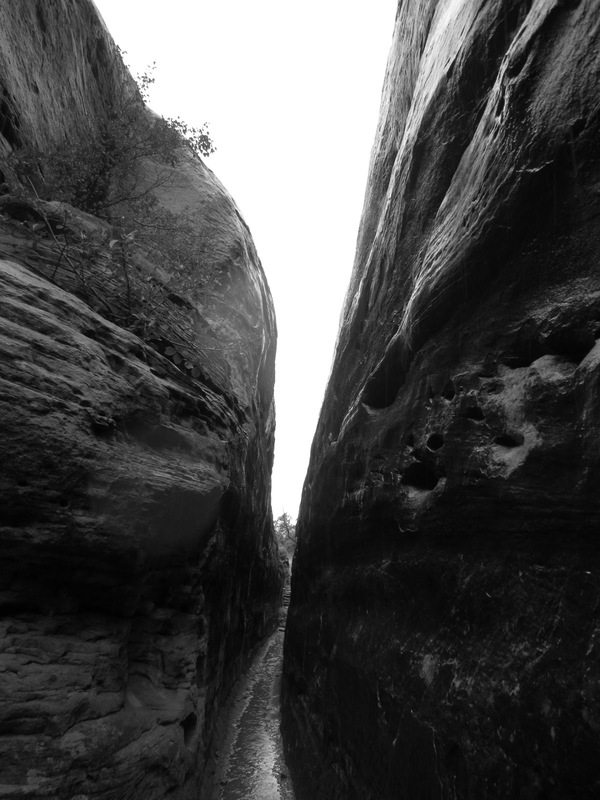 Knowing about the juniper trunks in the crevice and the ladders helped get us mentally prepared for the challenges. We let them know that we never made it to our CP5 camp site and bailed at EC2. 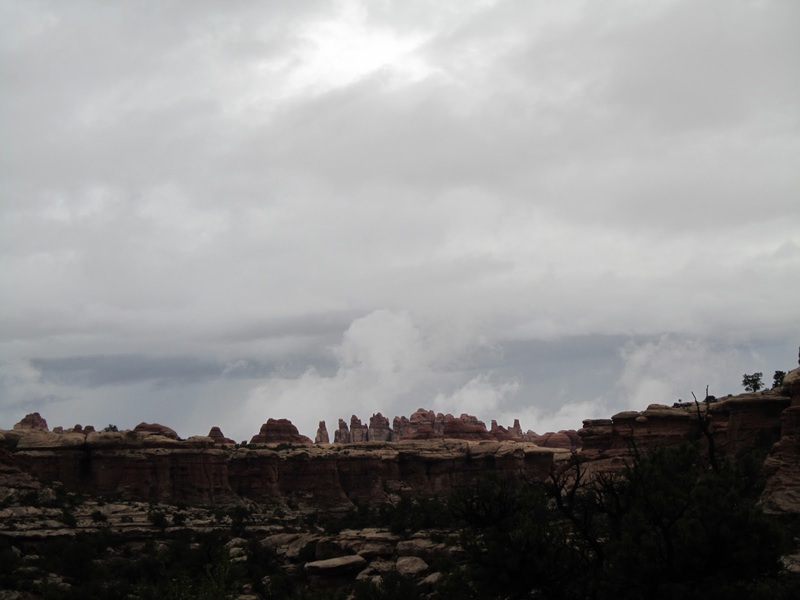 We recounted our hike out of the rain-swollen washes of Elephant Canyon and our rest in the shelter of the out-cropping on Chesler Park trail. They were enthralled by our tales. Like I said before, I really enjoyed and respected the rangers we met on this trip. They were great people and really cared. Now, do you remember I mentioned about cryptobiotic soil a post or two ago? It is the crust of the soil. It hold all the dirt and sand together and is really fragile. A single step onto it will crush and kill those organisms for decades. 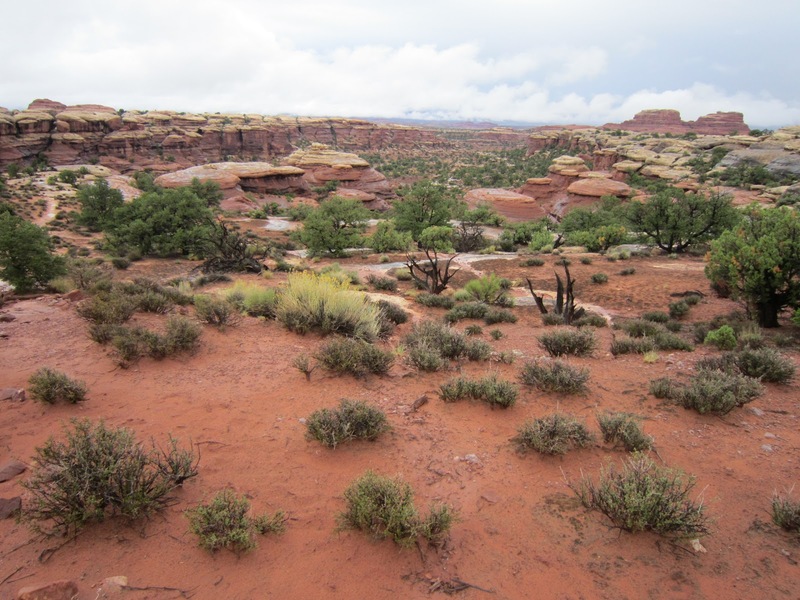 We had to agree that, when we hiked through Canyonlands, we would stay on hard, slick rock or in the washes and never walk on the cryptobiotic soil. We fessed up to the rangers though. We had to. 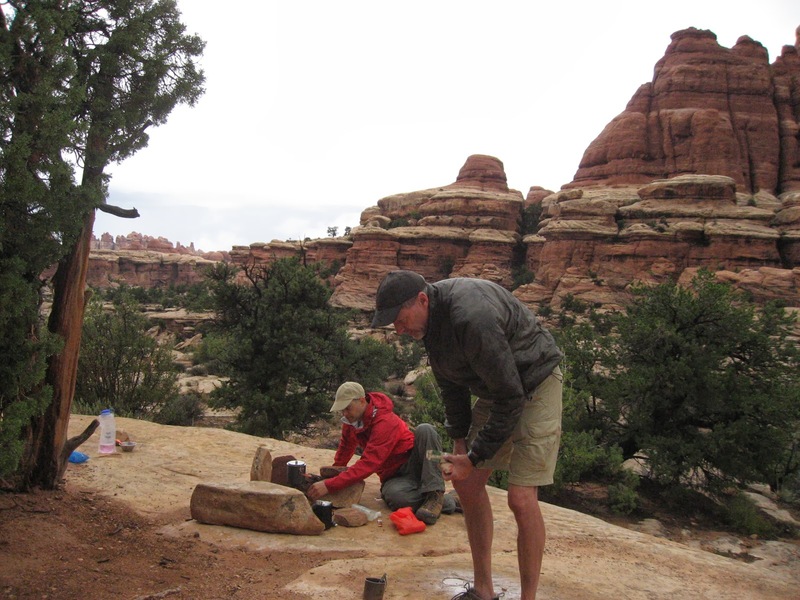 When we recounted our journey out of the EC2 camp site and along side of the full washes, we told them we had gone off-trail and unfortunately trampled some of the special soil. That was when Ranger Muse said You were in a survival situation and it is perfectly acceptable. A survival situation? Hmm. Hadn’t thought about it exactly like that. Kinda put a different spin on our adventure. Ranger Muse went on to tell us that our group of three was the only group out in the back-country and unaccounted for in this flooding. She said that there was much more rain coming and that it was a very wise decision to get out of the area as we did. This made us feel great. We had made a good survival decision. So many times I’ve heard in the news or read in a magazine about hikers, bikers, or backpackers that didn’t make good decisions and got themselves lost, hurt or dead. Here we had done the right thing by cutting our trip short. Felt good. 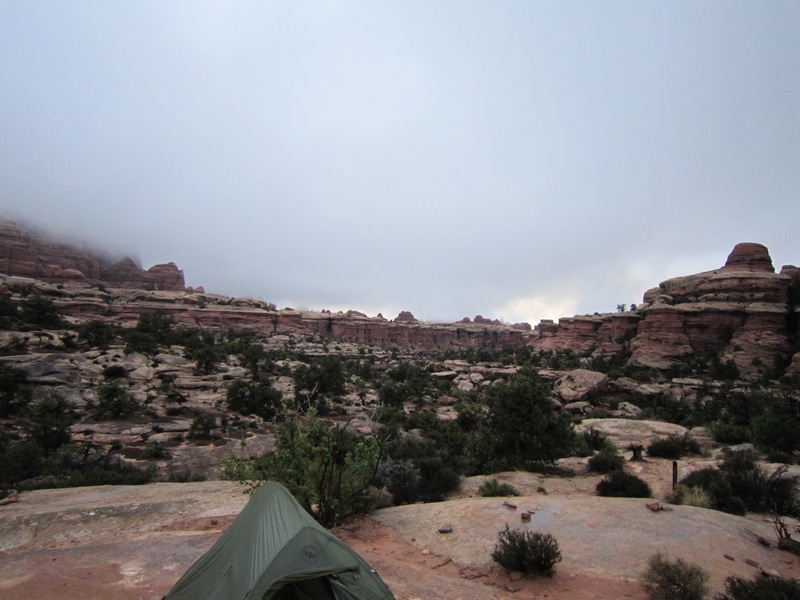 We left the visitor station feeling good and headed for Moab where we could get a room for the night. Along the drive out, the fog was still rolling around in the hills around our road. We paused and took a picture or two (right). 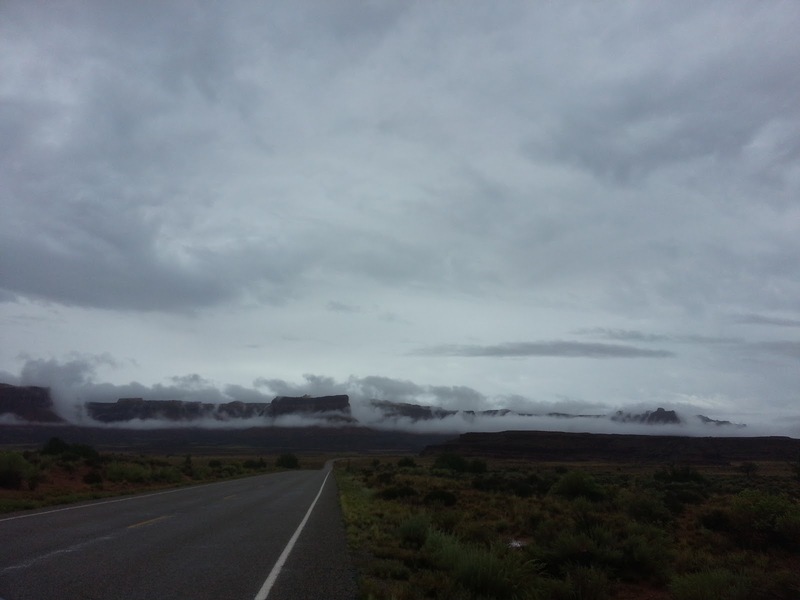 Then, with heater blasting and wet feet smelling, we said goodbye to The Needles and drove on to Moab. I’ll spare you the details here but Moab had just finished a music concert or something and ALL hotels were totally booked. I mean totally. We found two rooms in a Motel 6 and unpacked, took showers, set our gear to dry and headed out for a hot meal. We noticed the Moab Brewery (http://www.themoabbrewery.com/) on the way through Moab previously and decided that was the place for us. We ate and drank and retired to our hotel rooms: warm, dry and content for the night.